Creme patissiere flavoured with tonka bean served in an egg shell and topped with a rich passion fruit caramel. Use an egg shell cutter to neatly remove the top from 6 eggs. Separate the yolks from the whites and reserve the yolks. Rinse the egg shells until clean. Add the other two yolks to the six. Add the sugar to the yolks and beat until pale and fluffy and then grate in the tonka bean. Place the cream and milk in a saucepan and bring to the boil. Add the liquid to the tonka bean mixture and whisk vigorously. Return the mixture to a very low heat and cook until the cream coats the back of a spoon. Pour the mixture into the egg shells until they are 3/4 full. Fill a wok or large saucepan with water and heat until hot but not boiling. Carefully place the eggs in the pan and cook for about 25 minutes. Once cooked, the cream should be slightly wobbly. Remove from the pan and chill. Cut the passion fruits in hald and scrape out the seeds and pulp. Place the sugar in a frying pan and allow to melt, without stirring, to a golden caramel. Add the fleur de sel and then start adding the orange juice and the passion fruit pulp a little at a time. Keep mixing to prevent the salt from crystallising. Pour the caramel sauce into a bowl and allow to cool. Add a little water to loosen the sauce if necessary. 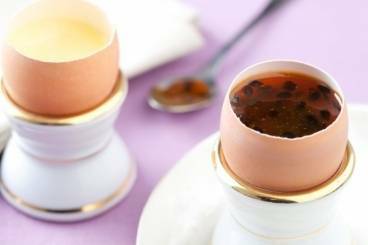 Add a little caramel sauce to each egg and serve immediately.